The simplicity of this You're Invited save the date card only adds to its elegance. 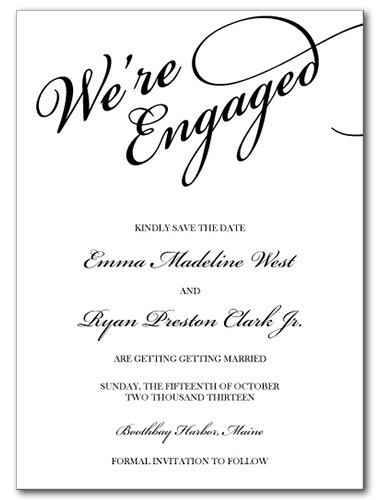 "We're Engaged" is presented prominently across the top, displayed in elegant hand or your choice of wedding font. Personalized wording reveals your customized information, while the black on white color scheme adds a timelessness to the look that works well for most any wedding theme you choose. You're Invited For the best experience, we recommend personalizing your stationery on a desktop computer.